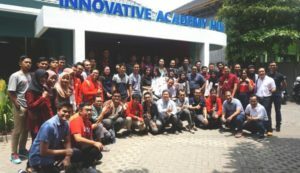 Indonesia’s Universitas Gadjah Mada has addressed and supported timely issues and needs of the country such as the challenges of humans in the Industry 4.0 era as well as helping start-ups to become the country’s next Unicorn. In a seminar with the theme, “Role of Academics in Facing the Challenges of Industry 4.0 Era”, held at the University, it was shared that as high as 65% of the people are still very much clueless about what kind of profession they will become. More importantly, around 75 – 375 million people all over the world are being forced to switch their current professions in line with the Industry 4.0 era, according to a recent report. The lifespan of a company is getting shorter. It either ended early or has been replaced by new kinds of businesses. As a result, workers must also be ready and capable to switch from one job to another. A major cause of this is the entry of the Industry 4.0 technologies such as big data, Internet of Things (IoT), cloud computing, and cognitive computing. These technologies have brought about robotics and automation which have become widely used in industries. Machines have started replacing jobs that were originally made for humans. Human power is relegated to becoming a secondary commodity as using machines is deemed to be more profitable. Because of this, people need to adjust and adapt to the new situation by improving on their technological skills. People should study more and take on lessons that are not limited to their own fields of study. People from the social sciences, for instance, are equipped with understanding technology and can learn to use it too. The purpose of education in this Industry 4.0 era is to teach about open-mindedness. In a different event, a total of 11 start-ups that participated in the 1,000 Digital Startup National Movement program succeeded in entering the incubation stage, according to a recent report. Innovative Academy (IA), which is the University’s incubation program, is on its 6th year in providing an opportunity for start-ups to create continuous innovations. The incubation stage is the most difficult for start-ups to pass. But this is the stage where they get assistance from experienced mentors. The 1,000 Digital Startup National Movement is expected to provide an avenue that will grow start-ups as well as be able to support national development programs later on. The start-ups that have successfully passed the incubation stage and have been able to penetrate the market will be entering the acceleration stage. In the acceleration stage, the start-ups will move towards improving the legal and financial aspects of their businesses.